Home > METRIC V-BELTS > K Section Metric V Belts for Specialty Machine Tools. > K38 Metric V Belt. Import K38/K965 Industrial V-Belt. > K30 Metric V Belt. BANDO K30/K762 Industrial V-Belt. > K27 Metric V Belt. BANDO K27/K686 Industrial V-Belt. > K26 Belt. Specialty belt for drill press and industrial tools. K26 Belt. 8x660 Specialty belt for drill press and industrial tools (Metric Part# K-660). Dimensions: 8mm W x 6mm T x 660mm L (inside circumference) = 5/16" TW x 26" Effective L (Li). Central Machinery drill press HH155300-30. Harbor Freight Drill Press V-Belt K660. Central Machinery Model 60238, 5-Speed Drill Press V-Belt K-660. Part . Central Machinery Model 38119, 5-Speed Drill Press V-Belt K26. Part 0805007. Model 60238, 5 Speed Bench Drill Press Belt. V-Belt belt part# 59, K-660. 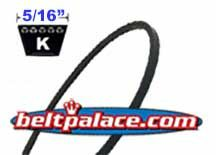 Delta 1349939 V-Belt for Delta Models 11-900 (Type 1), 11-950 (Types 1, 2, or 3), and DP115 (Type 1). Delta Part 1310066. Belt for Delta Model 11-950 Bench Drill Press (Types 1, 2, or 3). IN STOCK AND SALE PRICED FOR A LIMITED TIME! K28 Metric V Belt. IMPORT K28/K711 Industrial V-Belt. 5/16� Wide x 28� Outside Length (8mm x 711mm OC). 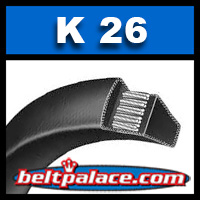 Replacement for Import brand Metric K28 V-Belts.